Aim: The aim of this study was to investigate the effect of microRNA-1224-5p (miR-1224-5p) on tumor endothelial cells (TECs) of human hepatocellular carcinoma (HCC). Subjects and Methods: Oligonucleotides were chemically synthesized and transfected into TECs using Lipofectamine 2000. TECs were divided into three groups, namely a control (CON) group without transfection, a negative control (NC) group transfected with negative control oligonucleotides and green fluorescent protein (GFP), and a micro-up (MU) group transfected with miR-1224-5p mimic and GFP. The expression of miR-1224-5p was quantified via quantitative reverse-transcription polymerase chain reaction (qRT-PCR). The proliferation of TECs was detected using 3-(4,5-dimethylthiazol-2-yl)-2,5-diphenyltetrazolium bromide (MTT) assay, and the optical density value at 490 nm was measured after every 24 h. Apoptosis was detected via flow cytometry using a 7-aminoactinomycin/APC Annexin V kit. The migration and invasion of TECs were detected using transwell assay. The tube formation ability was evaluated using the tube formation assay. Results: Oligonucleotides were successfully transduced into TECs, and the expression of miR-1224-5p was specifically upregulated. The results of qRT-PCR analysis showed that the expression of miR-1224-5p was significantly upregulated in the MU group (2–ΔΔCt = 3.27 ± 0.15) than in the CON group (2–ΔΔCt = 1) and NC group (2–ΔΔCt = 1.08 ± 0.11) (P < 0.01). 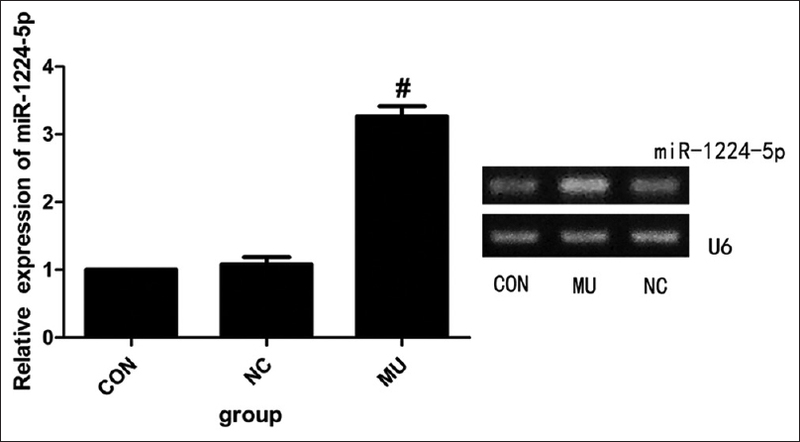 The results of MTT assay showed that the cell proliferation was significantly inhibited in the MU group at four time points than in the CON and NC groups (P < 0.01). 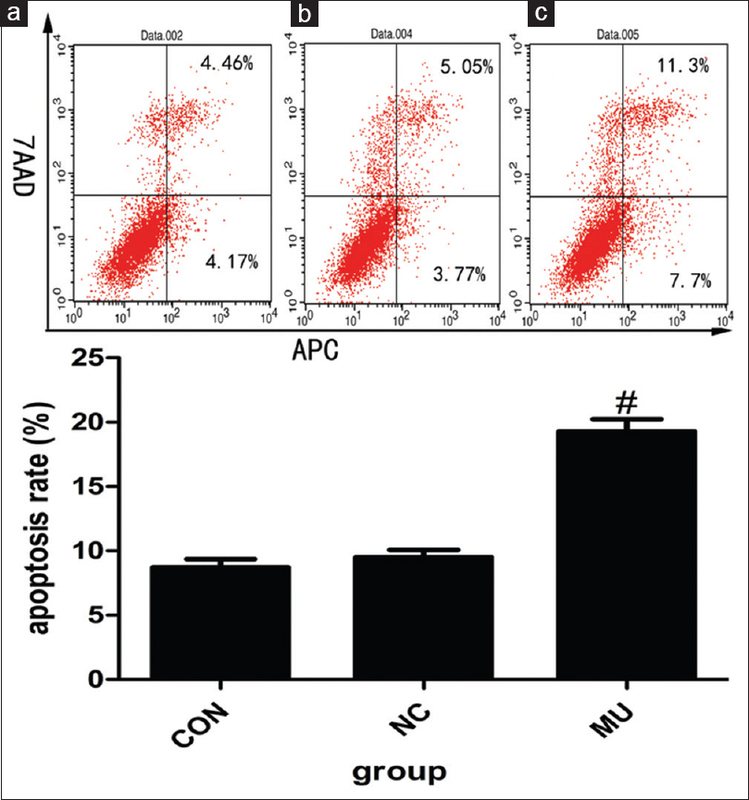 Flow cytometry analysis revealed the significant increase in apoptosis of cells from the MU group (19.29% ± 0.95%) than those from the CON (8.73% ± 0.64%) and NC (9.51% ± 0.56%) (P < 0.01) groups. The migration ability was significantly inhibited in MU group (51.0 ± 3.6) as compared with CON (77.7 ± 2.5) and NC (79.2 ± 3.5) groups (P < 0.01). The invasion ability of TECs was significantly inhibited in MU group (9.8 ± 1.3) than in CON (15.8 ± 0.8) and NC (15.4 ± 0.9) groups (P < 0.01). The ability of tube formation of TECs was completely inhibited in MU group but remained unaffected in CON and NC groups. Conclusions: miR-1224-5p may serve as a potential tumor suppressor in HCC. Upregulation in miR-1224-5p expression may decrease proliferation, induce apoptosis, inhibit migration and invasion, and suppress tube formation in TECs of human HCC. Hepatocellular carcinoma (HCC) is a common cancer worldwide. In particular, the occurrence of liver cancer is much common in men than in women. HCC is the second most common cause of cancer-related deaths in men and the sixth leading cause of cancer-related deaths in women. The only treatment that may cure patients with HCC is surgical resection or liver transplantation. However, only about 20% of patients may receive surgical treatment, owing to limitations such as the stage of the carcinoma, liver function, and function of other organs. Furthermore, no effective treatment strategy is yet available after the failure of surgical treatment, especially for patients with advanced HCC. Therefore, identification of novel therapeutic strategies for HCC is desirable. Recent evidence show that tumor microenvironment plays an important role in the progression of cancer. In cancer, tumor cells are very aggressive, and a variety of associated elements from the tumor microenvironment such as tumor stroma, blood vessels, and infiltrating inflammatory cells play the role of supporting players to aid in the progression of malignancy. The nontumor cells in the tumor microenvironment may be modified by the cancerous cells to produce a variety of materials that enhance the proliferation and invasion of the tumor, such as growth factors, chemokines, and matrix-degrading enzymes. Recent studies have suggested various approaches to target different cell types in the tumor microenvironment such as the tumor stroma, tumor vasculature, and immune cells. Hence, treatment regimens that target the tumor microenvironment are thought to offer promising effects. Hepatocellular cancer is a solid tumor with rich blood supply. HCC growth, invasion, and metastasis are all closely associated with angiogenesis. Therefore, regulation of tumor angiogenesis may control the growth of tumor. The process of tumor development may be divided into two stages, namely the avascular stage and the vascular stage. The volume of tumor may be only 1–2 mm during the avascular stage owing to hypoxia. Disturbance in the balance between the angiogenic growth factors and their inhibitors may induce angiogenesis and progression to the vascular stage. During this stage, the growth of tumor is accelerated. Recent studies have mainly focused on stimulatory factors or inhibitory factors of tumor angiogenesis such as vascular endothelial growth factor, hepatocyte growth factor, and vascular endothelial growth factor inhibitor. Very few studies have been directed toward tumor vascular endothelial cells. Therefore, identification of specific molecular markers of tumor vascular endothelial cells may provide a new basis for antiangiogenic therapy in HCC. MicroRNAs (miRNAs) are a class of noncoding small RNA molecules comprising 20–22 nucleotides that regulate gene expression at the posttranscriptional level. In cellular pathways, miRNAs play important roles by regulating the expression of downstream target genes at protein level. Many recent studies have suggested that the abnormal expression of miRNA is associated with cell proliferation, apoptosis, invasion, and metastasis in many cancers.,,,, Abnormal expression of microRNA-1224-5p (miR-1224-5p) was recently shown to be associated with several human cancers.,, miR-1224-5p is known as a tumor suppressor in malignant gliomas. However, little is known about the expression and function of miR-1224-5p in tumor endothelial cells (TECs) of human HCC. Our previous studies revealed the downregulation of miR-1224-5p expression in TECs of human HCC. The normalized intensity of hepatic sinusoidal endothelial cells (HSECs) and TECs was 320.137967 and 213.236189, respectively, whereas the log2 (TEC/HSEC) was −0.586241, P = 0.000285 (selection criteria to identify differentially expressed genes were established at log2 |Fold change| ≥0.585 and P < 0.05). Therefore, miR-1224-5p may be a tumor suppressor in TECs of human HCC. To confirm this hypothesis, we designed the present study. In this study, we demonstrate that the exogenous expression of miR-1224-5p in TECs of human HCC may inhibit the proliferation, migration, invasion, and angiogenesis capability and promote apoptosis of TECs. Our findings provide the first evidence of the role of miR-1224-5p as a tumor suppressor in TECs of human HCC. Based on these findings, miR-1224-5p may serve as a novel therapeutic target for human HCC. We obtained TECs of human HCC and human HSECs from Shanghai Xinran Biotechnology (Shanghai, China). 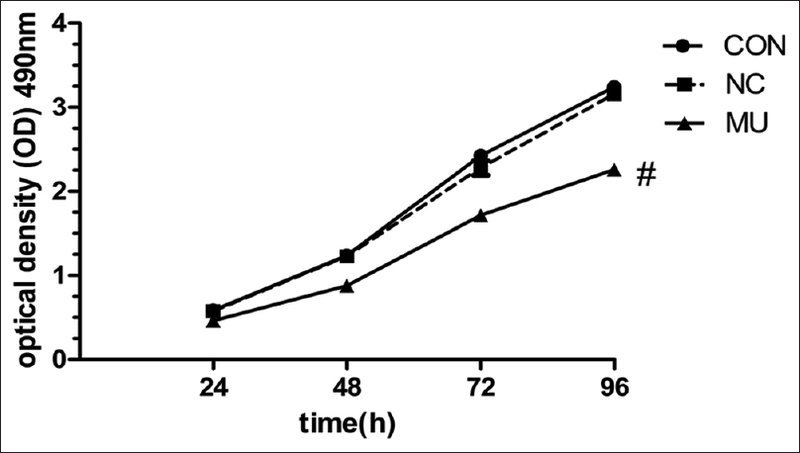 Cells were cultured in Dulbecco's Modified Eagle's Medium (DMEM) with high glucose supplemented with 10% fetal bovine serum (FBS), 100 U/mL penicillin, and 100 mg/mL streptomycin under 5% CO2 in a humidified incubator at 37°C. The experimental cells were divided into three groups as follows: a control (CON) group without transfection, negative control (NC) group transfected with negative control oligonucleotides and green fluorescent protein (GFP), and a micro-up (MU) group transfected with miR-1224-5p mimic and GFP. Oligonucleotides were chemically synthesized by Gene Pharma Co., Ltd. (Shanghai, China) based on the following sequences: hsa-miR-1224-5p mimic (MU group), 5'-GUGAGGACUCGGGAGGUGG-3'; scrambled miRNA (NC group), 5'-UUCUCCGAACGUGUCACGUTT-3'. Oligonucleotides were transfected into TECs using Lipofectamine 2000 (Invitrogen) for 6 h.
Quantitative reverse-transcription polymerase chain reaction (PCR) was performed to detect the expression of miR-1224-5p in different groups. U6 small nuclear RNA was used as the internal standard control. Total RNA was harvested from cells of different groups using the Trizol reagent (Invitrogen) according to the manufacturer's instructions. For reverse transcription, 5 μg of total RNA was converted to cDNA using a TaqMan MicroRNA Reverse Transcription Kit (Fermentas) according to the manufacturer's protocol. The resulting cDNA was diluted 1:10 and used for PCR with 4 μL of miR-1224-5p or U6 TaqMan primers and SYBR Green/Fluorescein qPCR Master Mix (Fermentas) in the ABI PRISM 7900HT (Applied Biosystems, Foster City, CA, USA). The sequences of the primers were as follows: miR-1224-5p forward, 5'-TGCGCGTGAGGACTCGGGA-3'; miR-1224-5p reverse, 5'-CTCAAGTGTCGTGGAGTCGGCAA-3'; U6 forward, 5'-CGCTTCGGCAGCACATATAC-3'; U6 reverse, 5'-AAATATGGAACGCTTCACGA-3'. PCR amplification from cDNA was performed in a final volume of 25 μL, and the cycling parameters included preheating at 95°C for 10 min, followed by 40 cycles of 95°C for 30 s and 60°C for 1 min and a melting curve analysis. The specificity of the PCR amplification was confirmed via a dissociation curve analysis. All reactions were performed in triplicates. ΔCt data were automatically collected and −ΔΔCt was calculated using the following formula: −ΔΔCt = ΔCt of CON group −ΔCt of the NC or MU group. The relative expression of the target gene was calculated using 2−ΔΔCt. Cells from each group were seeded at a density of 5000 cells/well in 96-well plates (five replicates per well per condition) and cultured overnight. The cells were transfected with miR-1224-5p mimic or a scrambled control construct. The proliferation of the cells was measured every 24 h after transfection using an MTT Cell Proliferation Assay Kit (Beyotime, China) according to the manufacturer's instructions. The cell viability was determined at 490-nm absorbance using a microplate reader, and the results were statistically analyzed. Apoptosis was determined using a 7-amino-actinomycin (7-AAD)/APC Annexin V kit (eBioscience, San Diego, CA, USA). TECs from each group were plated into six-well plates and transfected with oligonucleotides. The apoptosis ratio was analyzed 48 h after transfection according to the manufacturer's instructions. This assay allows identification of early apoptotic cells (7-AAD negative, APC Annexin V positive) and late apoptosis or already dead cells (both APC Annexin V and 7-AAD positive). Assessment of apoptosis was repeated in triplicates. A total of 3 × 104 cells were resuspended in serum-free DMEM after transfection and placed in the top portion of a transwell chamber with 8-μm pores (Millipore). The lower portion of the chamber contained 10% FBS as a chemoattractant. The chambers were incubated at 37°C in 5% CO2 for 12 h. Nonmigrating cells on the top of the membrane were removed with cotton swabs. Cells that migrated to the bottom of the insert were fixed with 95% ethanol, stained with 0.2% crystal violet (Beyotime, China), and counted and photographed under ×100 magnification. Five random fields were analyzed in each chamber. A total of 3 × 104 cells were resuspended in serum-free DMEM after transfection and placed on the top portion of a transwell chamber with 8-μm pores (Millipore) and coated with 30 mg/cm2 Matrigel extracellular matrix gel (Sigma-Aldrich, USA). The lower portion of the chamber contained 10% FBS as a chemoattractant. The chambers were incubated at 37°C in 5% CO2 for 24 h. Cells on the top of the membrane were removed with cotton swabs. Cells that invaded to the bottom of the insert were fixed with 95% ethanol, stained with 0.2% crystal violet (Beyotime, China), and counted and photographed under ×100 magnification. Five random fields were analyzed in each chamber. A total of 5 × 104 TECs were resuspended in DMEM supplemented with 10% FBS after transfection and seeded in 48-well culture dishes coated with Matrigel. Peak tube formation was observed at 12 h posttreatment, and five random fields were observed under a microscope. This experiment was independently repeated thrice. All data were expressed as the mean ± standard deviation. SPSS 17.0 software (SPSS Inc., Chicago, IL, USA) was used for statistical analysis. Differences among groups were assessed using an unpaired Student's t-test. P values less than 0.05 were considered statistically significant. After 24 h of transfection, the expression of GFP was observed under a fluorescence microscope. [Figure 1]A1, [Figure 1]B1, and [Figure 1]C1 shows the morphology of cells in the CON, NC, and MU groups, respectively, under bright field. [Figure 1]A2, [Figure 1]B2, and [Figure 1]C2 shows the same fields under green fluorescence. The CON group showed no green fluorescence [Figure 1]A2, whereas obvious green fluorescence was reported for the NC group [Figure 1]B2 and MU group [Figure 1]C2. These results indicate that the oligonucleotides were successfully transfected into TECs. As seen in [Figure 2], the expression of miR-1224-5p was significantly increased in the MU group (2−ΔΔCt = 3.27 ± 0.15) as compared to the CON group (2−ΔΔCt = 1) and the NC group (2−ΔΔCt = 1.08 ± 0.11) (P < 0.01). No significant difference was observed between the NC and CON groups (P > 0.05). As shown in [Figure 3], cell proliferation was significantly inhibited in MU group at four time points (optical density value at the wave length of 490 nm [OD490] from 24 to 96 h was 0.460 ± 0.022, 0.878 ± 0.018, 1.716 ± 0.035, and 2.257 ± 0.054) as compared with the CON group (OD490 from 24 to 96 h was 0.587 ± 0.006, 1.238 ± 0.005, 2.426 ± 0.040, and 3.240 ± 0.048) and the NC group (OD490 from 24 to 96 h was 0.575 ± 0.004, 1.228 ± 0.057, 2.279 ± 0.086, and 3.154 ± 0.038) (P < 0.01). On the other hand, the cell proliferation was unaffected in CON and NC groups (P > 0.05). [Figure 4] shows the apoptosis of TECs from three groups. No significant difference was observed between the CON group (8.73% ± 0.64%) and NC group (9.51% ± 0.56%) (P > 0.05). However, the apoptosis percentage was significantly higher in the MU group (19.29% ±0.95%) than in other groups (P < 0.01). 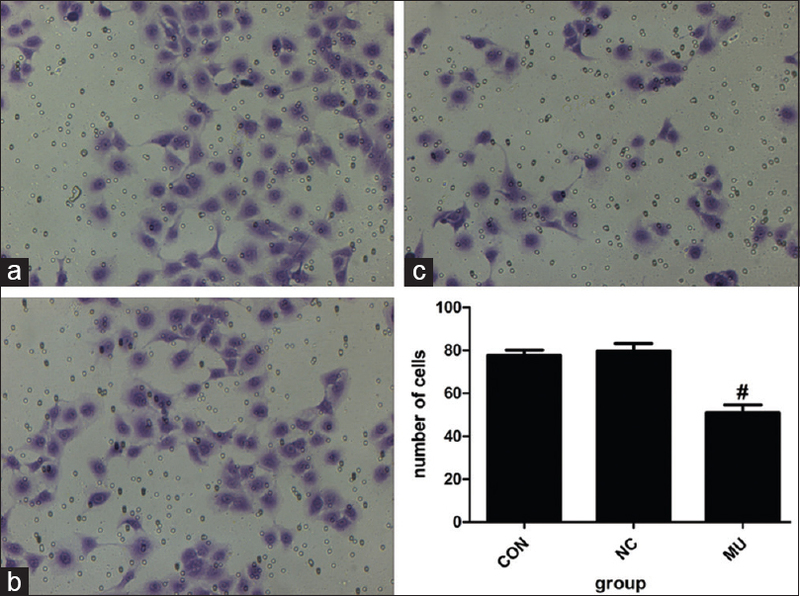 As shown in [Figure 5], the number of cells that migrated to the lower portion of the chamber in the CON, NC, and MU groups was 77.7 ± 2.5, 79.2 ± 3.5, and 51.0 ± 3.6, respectively. Thus, the migration ability was significantly inhibited for TECs from the MU group as compared to those from the CON and NC groups (P < 0.01). No significant difference was observed between the CON and NC groups (P > 0.05). 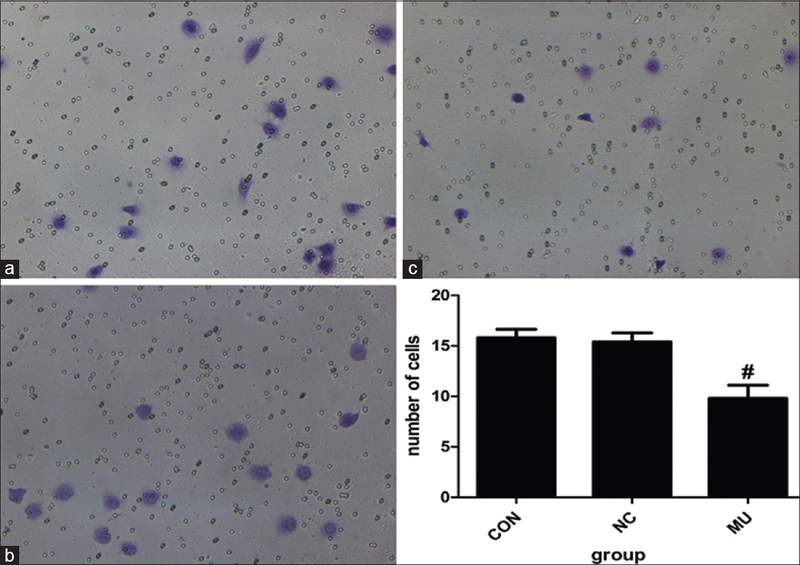 As observed in [Figure 6], the number of cells that invaded the lower portion of the chamber in the CON, NC, and MU groups was 15.8 ± 0.8, 15.4 ± 0.9, and 9.8 ± 1.3, respectively. Thus, the invasion ability was significantly inhibited for TECs from the MU group as compared with those from CON and NC groups (P < 0.01). No significant difference was observed between the CON and NC groups (P > 0.05) [Figure 6]. As observed in [Figure 7], the ability of tube formation was unaffected in TECs from the CON and NC groups. However, the tube formation ability of cells from the MU group was inhibited. Several recent studies have demonstrated the influence of angiogenesis on tumor germination and growth., Therefore, the selective inhibition of TECs of HCC may serve as a more effective and less toxic therapeutic method for the treatment of patients with HCC. miRNAs play an important role in a variety of cellular processes such as proliferation, apoptosis, differentiation, and cellular migration at posttranscriptional level.,,, Many miRNAs have been found as tumor suppressors and their expressions are downregulated in diverse human cancers., Several independent research groups have reported the downregulation of miR-1224-5p in colorectal, rectal, and lung cancers.,, However, the expression and function of miR-1224-5p in HCC remain unclear. In this study, we explored the effects of the upregulation of miRNA-1224-5p expression on the biological behaviors of TECs from HCC and found that miR-1224-5p upregulation dramatically repressed the proliferation, migration, invasion, and tube formation abilities of TECs of HCC and promoted cell apoptosis. Tumorigenesis is known to be associated with the imbalance between cell proliferation and apoptosis. Therefore, in this study, we observed the effect of miR-1224-5p on the proliferation and apoptosis of TECs. The results of 3-(4,5-dimethylthiazol-2-yl)-2,5-diphenyltetrazolium bromide assay indicated that miR-1224-5p upregulation could significantly decrease the proliferation of TECs. The results of apoptosis detection assay also showed that the upregulation of miR-1224-5p could significantly induce apoptosis in TECs. The death-inducing signaling pathway and mitochondrial pathway are the two major pathways of cellular apoptosis. The mechanism underlying the apoptosis-inducing effect of miR-124-5p in TECs is yet unclear and further studies are warranted to reveal the potential mechanism. Tumor invasion and metastasis are important causes of morbidity and death in patients with liver cancer. During the progression of invasion and metastasis, blood vessels play an important role. Our experiments for the evaluation of the in vitro migration, invasion, and tube formation abilities showed that the upregulation of miR-1224-5p expression could significantly suppress the migration, invasion, and tube formation abilities of TECs of human HCC. However, we failed to study the effects of miR-1224-5p in solid HCC in vivo and may consider this aim as our primary mission in the near future. In summary, our study demonstrated that miR-1224-5p may serve as a potential tumor suppressor in HCC. Upregulation in the expression of miR-1224-5p may result in the decrease in the proliferation, induction of apoptosis, inhibition of migration and invasion, and suppression of tube formation in TECs of human HCC. These data suggest that miR-1224-5p may play a critical role in the development of HCC as a tumor suppressor miRNA. The mechanism underlying the effects described above still requires further research. We have found some potential target genes of miR-1224-5p, such as origin recognition complex subunit 2 and cAMP-responsive element-binding protein 1 (CREB1), using the software TargetScan. CREB1 is a transcription factor that has a central role in the regulation of the expression of multiple target genes such as B-cell lymphoma 2 (Bcl2 associated with apoptosis) and matrix metalloproteinase-9 (MMP9 associated with invasion)., We suggest that the expression of miR-1224-5p may reduce the expression of CREB1, which modulates the downstream MMP9 and Bcl-2 and therefore regulates cell proliferation, invasion, and apoptosis. Future studies with luciferase activity assay and northern blotting may help us confirm this hypothesis. In addition, we will perform in vivo experiments to observe the effect of miR-1224-5p on the growth, invasion, and metastasis of HCC. The results of our researches show that upregulation in miR-1224-5p expression may decrease proliferation, induce apoptosis, inhibit migration and invasion, and suppress tube formation in TECs of human HCC. MiR-1224-5p may serve as a potential tumor suppressor in HCC. The cell culture experiments were performed in the laboratory of “Key Laboratory of Hubei Province for Digestive System Disease.” The authors would like to thank Professor Hong Xia from the Institute of Digestive and Liver Diseases, Wuhan University, for his excellent technical support. Raza A, Sood GK. Hepatocellular carcinoma review: Current treatment, and evidence-based medicine. World J Gastroenterol 2014;20:4115-27. Carr BI, Guerra V. HCC and its microenvironment. Hepatogastroenterology 2013;60:1433-7. Tahmasebi Birgani M, Carloni V. Tumor microenvironment, a paradigm in hepatocellular carcinoma progression and therapy. Int J Mol Sci 2017;18. pii: E405. Werb Z, Lu P. The role of stroma in tumor development. Cancer J 2015;21:250-3. Hida K, Maishi N, Torii C, Hida Y. Tumor angiogenesis – Characteristics of tumor endothelial cells. Int J Clin Oncol 2016;21:206-12. Peske JD, Woods AB, Engelhard VH. Control of CD8 T-cell infiltration into tumors by vasculature and microenvironment. Adv Cancer Res 2015;128:263-307. Seaman S, Stevens J, Yang MY, Logsdon D, Graff-Cherry C, St. Croix B, et al. Genes that distinguish physiological and pathological angiogenesis. Cancer Cell 2007;11:539-54. Marx J. Angiogenesis. A boost for tumor starvation. Science 2003;301:452-4. Hobert O. Gene regulation by transcription factors and microRNAs. Science 2008;319:1785-6. Campagnolo L, Telesca C, Massimiani M, Stuhlmann H, Angelico M, Lenci I, et al. Different expression of VEGF and EGFL7 in human hepatocellular carcinoma. Dig Liver Dis 2016;48:76-80. Osada S, Matsui S, Komori S, Yamada J, Sanada Y, Ihawa A, et al. Effect of hepatocyte growth factor on progression of liver metastasis in colorectal cancer. Hepatogastroenterology 2010;57:76-80. Duan L, Yang G, Zhang R, Feng L, Xu C. Advancement in the research on vascular endothelial growth inhibitor (VEGI). Target Oncol 2012;7:87-90. Lagos-Quintana M, Rauhut R, Lendeckel W, Tuschl T. Identification of novel genes coding for small expressed RNAs. Science 2001;294:853-8. Selbach M, Schwanhäusser B, Thierfelder N, Fang Z, Khanin R, Rajewsky N, et al. Widespread changes in protein synthesis induced by microRNAs. Nature 2008;455:58-63. Tutar L, Tutar E, Tutar Y. MicroRNAs and cancer; an overview. Curr Pharm Biotechnol 2014;15:430-7. Yang G, Yin B. The advance of application for microRNAs in cancer gene therapy. Biomed Pharmacother 2014;68:137-42. Lao G, Liu P, Wu Q, Zhang W, Liu Y, Yang L. et al. Mir-155 promotes cervical cancer cell proliferation through suppression of its target gene lkb1. Tumour Biol 2014;35:11933-8. Qiu G, Lin Y, Zhang H, Wu D. MiR-139-5p inhibits epithelial-mesenchymal transition, migration and invasion of hepatocellular carcinoma cells by targeting ZEB1 and ZEB2. Biochem Biophys Res Commun 2015;463:315-21. Qiu D, Han F, Zhuang H. MiR-499 rs3746444 polymorphism and hepatocellular carcinoma risk: A meta-analysis. J Cancer Res Ther 2018;14:S490-3. Mosakhani N, Lahti L, Borze I, Karjalainen-Lindsberg ML, Sundström J, Ristamäki R, et al. MicroRNA profiling predicts survival in anti-EGFR treated chemorefractory metastatic colorectal cancer patients with wild-type KRAS and BRAF. Cancer Genet 2012;205:545-51. Della Vittoria Scarpati G, Falcetta F, Carlomagno C, Ubezio P, Marchini S, De Stefano A, et al. Aspecific miRNA signature correlates with complete pathological response to neoadjuvant chemoradiotherapy in locally advanced rectal cancer. Int J Radiat Oncol Biol Phys 2012;83:1113-9. Nymark P, Guled M, Borze I, Faisal A, Lahti L, Salmenkivi K, et al. Integrative analysis of microRNA, mRNA and aCGH data reveals asbestos – And histology-related changes in lung cancer. Genes Chromosomes Cancer 2011;50:585-97. Qian J, Li R, Wang YY, Shi Y, Luan WK, Tao T, et al. MiR-1224-5p acts as a tumor suppressor by targeting CREB1 in malignant gliomas. Mol Cell Biochem 2015;403:33-41. Cui ZH, Shen SQ, Chen ZB, Hu C. Growth inhibition of hepatocellular carcinoma tumor endothelial cells by miR-204-3p and underlying mechanism. World J Gastroenterol 2014;20:5493-504. Liu X, Fang H, Chen H, Jiang X, Fang D, Wang Y, et al. An artificial miRNA against HPSE suppresses melanoma invasion properties, correlating with a down-regulation of chemokines and MAPK phosphorylation. PLoS One 2012;7:e38659. Collet G, Szade K, Nowak W, Klimkiewicz K, El Hafny-Rahbi B, Szczepanek K, et al. Endothelial precursor cell-based therapy to target the pathologic angiogenesis and compensate tumor hypoxia. Cancer Lett 2016;370:345-57. Ma H, Pan JS, Jin LX, Wu J, Ren YD, Chen P, et al. MicroRNA-17~92 inhibits colorectal cancer progression by targeting angiogenesis. Cancer Lett 2016;376:293-302. Tang L, Chen F, Pang EJ, Zhang ZQ, Jin BW, Dong WF, et al. MicroRNA-182 inhibits proliferation through targeting oncogenic ANUBL1 in gastric cancer. Oncol Rep 2015;33:1707-16. Zhang Y, Peng Z, Zhao Y, Chen L. MicroRNA-25 inhibits cell apoptosis of human gastric adenocarcinoma cell line AGS via regulating CCNE1 and MYC. Med Sci Monit 2016;22:1415-20. Sathyanarayanan A, Chandrasekaran KS, Karunagaran D. MicroRNA-146a inhibits proliferation, migration and invasion of human cervical and colorectal cancer cells. Biochem Biophys Res Commun 2016;480:528-33. Cong F, Wu N, Tian X, Fan J, Liu J, Song T, et al. MicroRNA-34c promotes osteoclast differentiation through targeting LGR4. Gene 2017;610:1-8. Xi JJ. MicroRNAs in cancer. Cancer Treat Res 2013;158:119-37. Williams GT, Smith CA. Molecular regulation of apoptosis: Genetic controls on cell death. Cell 1993;74:777-9. Arya R, White K. Cell death in development: Signaling pathways and core mechanisms. Semin Cell Dev Biol 2015;39:12-9. Wu GJ, Bao JS, Yue ZJ, Zeng FC, Cen S, Tang ZY, et al. Elevated expression of matrix metalloproteinase-9 is associated with bladder cancer pathogenesis. J Cancer Res Ther 2018;14:S54-9. Tafsiri E, Darbouy M, Shadmehr MB, Cho WC, Karimipoor M. Abberent expression of oncogenic and tumor-suppressive microRNAs and their target genes in human adenocarcinoma alveolar basal epithelial cells. J Cancer Res Ther 2016;12:395-400.